This new video features live concert footage from August 2001 at the Universal Amphitheatre in Los Angeles during the band's Beyond Good and Evil tour. It includes "Rise", "Take the Power", "My Bridges Burn", "Breathe", "True Believers" and "War" from that album, along with all-time live favorites including "Fire Woman", "Love Removal Machine", "Lil' Devil", "Rain", "She Sells Sanctuary" and more. The DVD also features 26 minutes of behind the scenes footage! 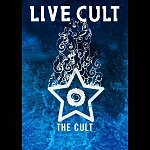 "The Cult knows how to rock an audience and this Los Angeles concert is no exception!"